A mother's love makes all the difference, and this ring expresses your gratitude for that love in the most fashionable way. A beautiful choice for any mom and any occasion, the ring is forged of radiant 10K white gold and expertly shaped into the word "Mom" with pretty script. 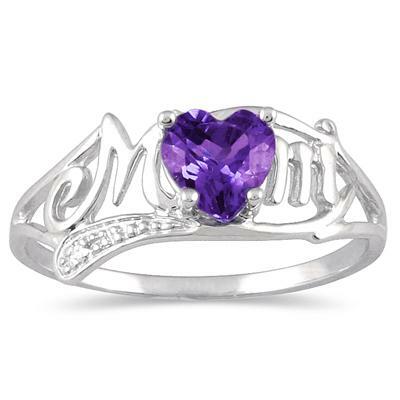 The center holds a charming amethyst gemstone to give her that extra pop of color. The amethyst measures 5 by 5mm and is heart-shaped to shower her with love, while the diamond accent adds just the right amount of twinkle. We guarantee our Amethyst and Diamond Heart Shaped MOM Ring to be high quality, authentic jewelry, as described above.